Do you really need VIPs in your game? The answer is, most of the time, “no.” Sorry to start with such a firm negative, but VIPs are not indispensable. If what we are interested in is giving our campaign some verisimilitude, that “setting simulation” we spoke of, a passing reference will suffice. An angry smuggler can rant about being swindled by that Corellian guy that flies with a Wookiee bodyguard, Solo or whatever. The heroes don’t really need to meet Han Solo in the flesh, just like you don’t really need to meet Queen Elizabeth to know that she exists. Even if you can’t take that route because you want the VIP to take an active role in the game, you can always use an original character in their place unless you really need the player characters to meet someone specific and completely irreplaceable—like, say, the leader of the Galactic Empire. Even in most cases where you’d think only the original VIP would do, you can usually find a way to use your own original proxy: do they really need to meet Palpatine in person or could they meet one of his advisers or personal enforcers? It actually makes Palpatine seem more remote and unreachable, as he should be! By relying on your own original non-player characters instead of using established ones you get to make the campaign your own, as you can easily tie them to the player characters’ backstories or to your own campaign’s lore. VIPs cast a long shadow, too: it’s too easy for the PCs to be completely eclipsed by the superior abilities of a VIP, and that’s something that no half-decent GM should allow. I don’t have many categorical rules when it comes to GMing, but there’s one that I think should always be followed: PCs are more important than NPCs. So then, why would we ever use VIPs? The answer is simple: because some people love interacting with VIPs. Because it’s awwwwwesome, with as many w’s as you want. This is a clear case of Rule of Cool. There’s an undeniable charm in knowing that Han Solo got your back or that your mission entails rescuing Mace Windu from a Separatist ambush. Use VIPs only if you think that your players are going to love it, not if you are the only one who wants to see the VIPs in action, and this an extremely important distinction to make: you are not writing fan fiction here, you are both playing a game and working in a collaborative story. If you always wanted to see Luke Skywalker fighting droidekas over a lava pit, just write a fic about it, but don’t drag your players into your personal scenario to play second fiddle to a canon character. To sum things up: you don’t really need to use VIPs in your game to have a “true” Star Wars game, but most players are going to love it, so assume that eventually you are going to end up doing it. How often should you use VIPs? So now that we’ve determined that we are going to use VIPs at some point, the next question is how often they should appear. On VIP frequency… let me tell you all of the interactions with VIPs that my players had during my very first Star Wars RPG campaign, back when I was a clueless teenager: they had drinks with Talon Karrde and Mara Jade, they took on missions from Luke Skywalker, they unsuccessfully flirted with Leia Organa, they manned the Millennium Falcon‘s turrets on at least one occasion, they fought Boba Fett a few times, and one of the PCs even briefly became Darth Vader’s apprentice. All of this happened in the two months that the campaign lasted, maybe nine adventures in total. It was just too much. I was inexperienced and too excited about the idea of meeting my heroes, of actually playing as my heroes. I was drunk with power, to be honest. My players stopped caring whenever a new VIP appeared and, even worse, the PCs were eventually reduced to being background characters in the story of the movies and that’s one of the worst mistakes you can make as a GM. Player agency should never be tampered with. And that’s something that wouldn’t have happened had I been more careful with how often I used VIPs in the game. Now let me tell you how much I’ve used VIPs in my latest campaign: the PCs have met General Draven on Yavin 4, and they saw Cassian Andor for a few fleeting seconds. I didn’t even tell them it was Cassian at the time. That’s it. No other VIPs so far, and we have played for seven adventures. The players still feel as part of the Star Wars universe, but it’s Cassian and Draven who are secondary characters in their lives, as it should be. And do you think they got less of a thrill for it? They cheered when they realized who the Rebel spy was! Look, I made this collage and I like it, so it’s going to be in every single installment. Deal with it. How should you use your VIPs? So now that we’ve agreed on how often we are going to use VIPs, here are a few guidelines for how to use VIPs. They are not laws, of course, but merely observations from a couple of decades directing games. First, if what matters to you most is that the PCs interact with the VIP, it’s always better to use the VIP as a patron than in real combat. If for any reason you really want to use the character in combat, maybe because you know your players and you think that they are going to love fighting back to back with one of their favorite characters, then do it but make it quick and memorable. Don’t have the PCs accompany Luke Skywalker on an expedition to a Sith Temple and then find themselves bested by the young Jedi in every single task; have them meet Luke Skywalker when he’s leaving said Sith Temple, let them help him finish the last dark side ghoulies and marvel at his prowess in the Force, then have your adventure be about something else (maybe Luke found some ancient maps inside the Temple and wants the heroes to go explore them…). If you are using the VIP as an opponent, you are going to find a few very particular challenges. First of all, sooner or later you will hear the infamous “so can we kill Darth Vader?” or the even worse “oops we just killed Darth Vader.” Unless you are willing to deviate from canon in a drastic way, this can be a real headache. I personally don’t mind my games playing loose and fast with canon—you should see what I’ve done to Jan Dodonna—but I’m not really into having to suddenly improvise a whole alternate universe because of a lucky roll. 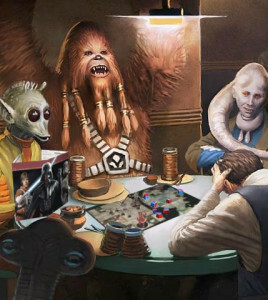 I’ve seen several ways to deal with this: you can make a deal with your players, telling them that if they defeat a major VIP he’s always going to somehow survive following the pulp traditions that Star Wars is based on. If that doesn’t work out, you can always make sure that the VIP has a route of escape ready, but this often reeks of manipulating and railroading if not done to perfection. It’s not easy, and that’s why this kind of VIP appearance should always be carefully planned in advance. Another piece of advice: try to avoid using a random “VIP Ex Machina”. It might be tempting to say “as your ship’s shields finally collapse and you get ready for annihilation, Rogue Squadron drops out of hyperspace” but it can very easily feel unfulfilling. The PCs are the heroes and they are suddenly being upstaged by some established characters. Again, and I will probably say this a dozen times through the article: the PCs are not the secondary characters, they are the protagonists. If you think that someone has to save their bacon and you want to make it fitting and memorable, it better be someone the characters are attached to, not someone the players are attached to. Finally, and this can be a painful truth, make sure you can accurately portray the VIPs or just don’t do it. That doesn’t mean you need to be a perfect impersonator, but make sure that your players can see the VIP in their mind’s eye. It’s the only point of using VIPs, after all, so if you feel like you are not up to the task, it’s better to avoid what’s going to end up being a very awkward situation. My General Draven is serious, stern, detached, and his voice falls to a low growl when enraged. My Boba Fett hisses short sentences, never going into full tirades. My Ahsoka Tano is serene, polite, and assertive. My Darth Vader is slow, deliberate, regal and threatening, and I always write a few sentences in advance that I first read aloud to make sure they could come from Vader, even if my actual voice sounds more like Salacious Crumb’s. It’s a big responsibility, yes, and it’s the reason I’ve used Vader a total of three times in more than twenty years. 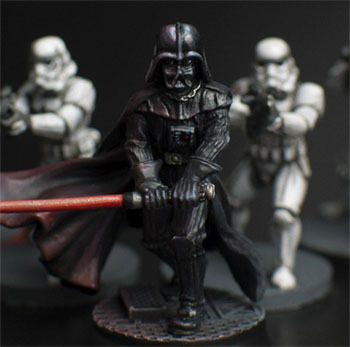 If a Vader appearance doesn’t make your players feel like the world is ending, there’s something seriously wrong there. Do we need official stats for VIPs? This is another big point of contention. The Star Wars rulebooks have historically been full of VIP stats. The West End Games editions always included tens of VIP stats, the Wizards of the Coast editions took this to ridiculous extents with some sourcebooks where more than two-thirds of the book would be nothing but VIPs (looking at you, Dark Side Sourcebook) and the people at Fantasy Flight Games have deviated from that tradition, making some gamers say that they miss the VIP stats. We are never happy, are we? 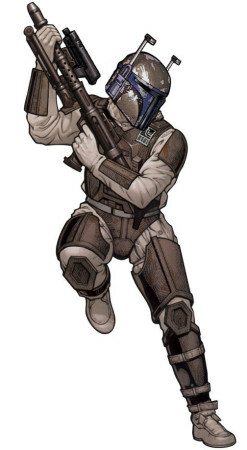 This is Niwar Crux and not at all a recolored collage of Dengar and Boba Fett, shut up. So anyway, what are VIP stats good for? In my experience, VIP stats are only useful as a benchmark, especially in older editions like WEG’s where it’s not that easy to calculate how challenging an opponent is going to be. For example, not too long ago I created Niwar Crux, a bounty hunter that I intended to become a recurring opponent. I took my old WEG sourcebooks and I made him a middle point between Jodo Kast and Dengar: dangerous but not too dangerous and not someone that the PCs aren’t eventually going to be able to beat. VIP stats end up being fodder for canon disputes and “my daddy Ulic Qel-Droma can beat your daddy Naga Shadow” discussions. If that’s your thing, so be it. You do you. But when it comes to use a VIP in your RPG, feel free to radically alter the stats to better serve the needs of your game. Fight the power! Finally, I want to make it clear that none of these guidelines are absolutes. I’m a firm believer in there not being one right way to either direct or play roleplaying games. If your game breaks every single one of these guidelines and it’s fun for everyone involved, so be it. I just feel that this is the easiest way to go around the use of VIPs, the one least likely to cause conflicts while still keeping the magic of sharing a drink with Luke Skywalker or being shot at by Boba Fett. Next time we meet, we are going to be talking about how to emotionally involve your players in the game. Until then, happy gaming! In my experience meeting a VIP should in the first place be fun… one of my old group’s favorite experiences was when we faced a mad scientist who was in collusion with the Emperor. We attacked the Imperial Palace and my character Kerk Korpil was turned pink after being used as a test subject and he recoiled in terror after facing the Emperor’s Force lightning. We couldn’t stop laughing and we remember that incident fondly. Another good suggestion is to keep the menace of the VIPs (enemies in this case) always close, but never materializing, keeping them on edge. On another occasion, my characters were hunted by the Empire and a large bounty was on their heads… they attended a music festival looking for a person, and when the announcer started speaking he simply said “And now with you… Boba Fett…” and I could see the look of terror in my players… “… and the Assassin Droids!!! !” and said band came out and started playing (I think I put up some Metallica on the speakers) and my players were still in shock! Eventually they battled some real bounty hunters on the session, but not actually Boba Fett.